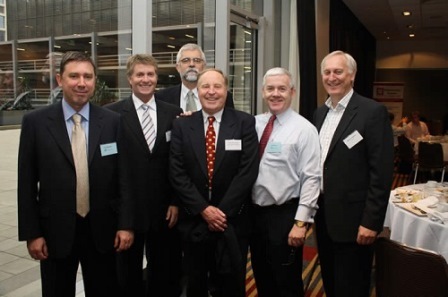 A recent Logistics Bureau (LB) breakfast seminar became a reunion gathering for many former Dawson Consulting staff. From left to right are, Tom Radovanic (LB) Mark Dawson (Microlistics) John Cole (LB) Kerry Hammond (RMIT) Rob O’Byrne (LB) and Mike Gleeson (Toll). Dawson Consulting was acquired by Logistics Bureau in 2007 (the acquisition did not include Microlistics). The Logistics Bureau breakfasts are held regularly throughout the year in Sydney, Melbourne, Bangkok and Ho Chi Minh City. For further details and the chance to register, see Logistics Bureau Events.